HILLARY CLINTON OVERWHELMED Bernie Sanders in South Carolina’s primary overnight, drawing staggering support from the state’s black Democrats and seizing an increasingly strong position as the presidential race barrels toward Super Tuesday’s crucial contests. Clinton’s lopsided win — she led by 48 points with nearly all precincts counted — provided an important boost for her campaign and a moment to wipe away bitter memories of her loss to Barack Obama in South Carolina eight years ago. She won the support of nearly nine in 10 black voters, crucial Democratic backers who abandoned her for Obama in 2008. During a raucous victory rally, Clinton briefly revelled in her sweeping support from South Carolina voters, hugging backers and posing with them for selfie photos. But then she pivoted quickly to the contests to come. “Tomorrow this campaign goes national,” she said. We are not taking anything, and we are not taking anyone, for granted. Sanders, expecting defeat, left the state even before voting was finished and turned his attention to next Tuesday’s delegate-rich contests. Putting South Carolina behind him, upon his arrival in Rochester, Minnesota, last night, he gave a campaign speech of more than 50 minutes to cheering supporters — and never mentioned the day’s events. Clinton’s victory came at the end of a day that saw Republican candidates firing insults at each other from Super Tuesday states. 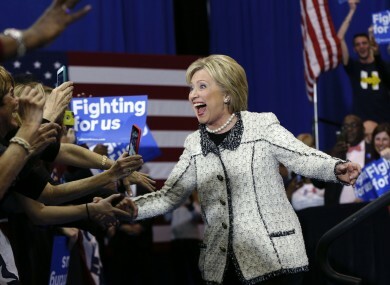 Though yesterday’s turnout was low, Clinton allies quickly touted the breadth of her victory. Besides blacks, she won most women and voters aged 30 and over, according to early exit polls. Sanders continued to do well with young voters, his most passionate supporters. He also carried those who identified themselves as independents. All registered voters could vote in either the Democratic or Republican primary but not in both. A self-described democratic socialist, Sanders has energised his supporters with impassioned calls for breaking up Wall Street banks and making tuition free at public colleges and universities. But the senator from Vermont, a state where about 1% of the population is black, lacks Clinton’s deep ties to the African-American community. Still, he did invest heavily in South Carolina, with 200 paid staff on the ground and an aggressive television advertising campaign. Exit polls showed six in 10 voters in the primary were black, by far the largest proportion in any of the contests so far. About seven in 10 said they wanted the next president to continue Obama’s policies, and only about 20% wanted a more liberal course of action, according to the polls conducted by Edison Research. Clinton’s campaign hopes her strong showing in South Carolina foreshadows similar outcomes in states like Georgia, Alabama, Tennessee and Virginia that vote on Tuesday and have large minority populations. Sanders is hoping to stay close to Clinton in the South while focusing most of his attention on states in the Midwest and Northeast, including his home state of Vermont. Sanders has built a massive network of small donors and has the money to stay in the race deep into the spring. Still, Clinton’s campaign sees a chance to build enough of a delegate lead to put the race out of reach during the sprint through March. Email “Hillary celebrates sweeping win over Bernie in South Carolina primary”. Feedback on “Hillary celebrates sweeping win over Bernie in South Carolina primary”.